The following lesson shows you how to pick markers of a well displayed in the IL/CL View. In the Control Panel, go to the View menu and open the IL/CL View to display the wells. Select the well that you want to pick the markers. At the well item row, click the Pick Well pencil icon to activate the edit mode for markers picking. Note: If you are not the owner of the active well marker set, you will not be allowed to edit the markers. 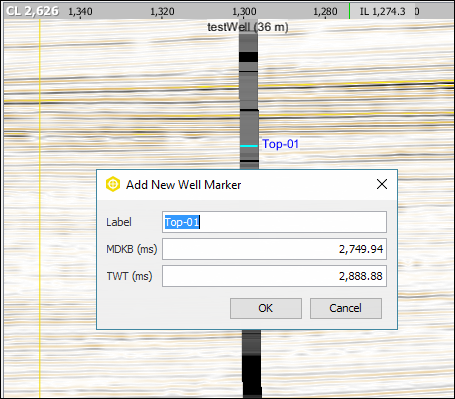 You can take ownership of the well marker set, create your own marker set, or change to use another marker set in order to edit the markers (see Defining Well Markers, Managing Well Components and Selecting Default Well Components). In the IL/CL View, click at a spot along the well where you want to add a well marker. The Add New Well Marker window will be displayed. At Label, type the name of the new well marker. You are not allowed to use spacing or commas in the label, but you can use hyphen or underscore. Type the measured depth of the new marker at MDKB. By default, it will show the depth at the level you click to add the new marker. Type the TWT/TVDSS of the new marker. By default, it will show the time/depth at which you added the new marker. Click OK to create the new well marker based on the defined settings. You can also move the existing markers up or down. Drag a marker and move it up or down. You can undo/redo the picking by clicking Undo/Redo in the Markers tab in the Configure Well window of the specific well item (see Managing Well Components). In the Control Panel, click the Pick Well pencil icon to disable the edit mode of the well marker picking. Alternatively, press Esc to disable picking. Tip: To delete a well marker, click the Pick Well pencil icon at the well item row. In the view that is displaying the markers, right-click the marker you wish to delete. 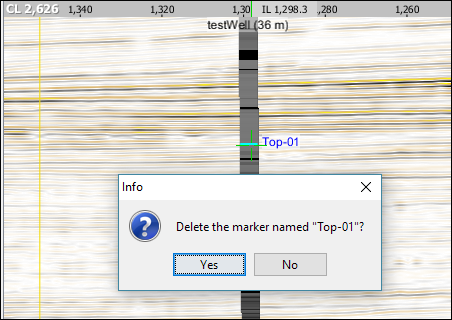 Click Yes to confirm the deletion of the well marker. At the well item row, click the pencil icon Pick Well to disable the edit mode of the well markers picking.